The back is comprised of two images – the phrase and the image. The image is of a drawing by Giovanni Borelli from his work De Motu Animalium, or On The Movement of Animals, first published in 1608. A mathematician, Borelli was one of the original pioneers of biomechanics and studied the movement of the human body and animals from a mechanical point of view.Â I was first introduced to his work in Russia at a military academy where science was the primary means of studying how to survive. This diagram is in the seal of Pramek created in 2004.Â When I designed this seal a decade ago I decided on the symbol of the ace with Borelliâ€™s weighted man inside of it.Â The black ace would mean a willingness to survive and come out on top as well as teach others to…and use science, represented by Borelliâ€™s diagram, to do so. The two are combined in this shirt for a reason. Owning the ground you stand on means three separate concepts in terms of survival. It combines the various layers of study within Pramek (or any self-defense study): Mental, physical, and spiritual confidence. To truly own the ground you stand on is to have a self-confidence that others see and know that wherever you are, you are in control of yourself and the space you exist in. You may not control the environment or the situation around you, but for where your feet are planted, you are in control. Anything that comes into that space you can control and work with. Unfortunately, true confidence does not just happen – it is learned through knowledge and applying that knowledge to gain experience. Mental confidence is the knowledge of the world around you and the natural laws and science that govern it. Borelli’s drawing reminds us of this…the knowledge of the mechanics and physical laws that govern our movement and those around us. The physiology that makes up our body. The neurology that governs our movements. The knowledge of psychology to control our own actions and to work with or against the psychology of others. The vision to know our goals in relation to what we wish to do, what we can do, and the strategy, tactics, and methods (physical and nonphysical) to achieve those goals. How can one fight an enemy they do not understand to the core? To win against such an enemy we should know the science that govern ourselves, and through this we find universal knowledge about anyone we come into contact with.Â When we study the enemy we first study ourselves, finding our strength, weakness, and then can use that knowledge to overcome an enemy we then understand.Â If you are left-handed and your enemy is left-handed, you should know very well their strength and weakness through studying your own.Â In knowing ourselves we learn about our enemy. Physical confidence is confidence in the body and its potential to accomplish a task. Physical confidence means we have trained our body through combative experience and physical fitness to survive in the world around us. It has been said, â€˜cleanliness is next to godliness.â€™Â Ones physical appearance is a reflection of self-respect shown through the care of their primary weapon – our body.Â We clean our weapons and buy the best gear, keep it clean and functional, but often times we ignore our body that will use it.Â We have to strive to be physically fit, which translates to the ability to best utilize the natural weapons we have.Â Our muscular, circulatory, and respiratory systems govern much of our capability to win and are defined by how far we push them in training. To survive in the world we have to be strong and in control of our heart rate and breath to fuel our body. We must also strive to control our neurology, to train so we create the best â€˜muscle memoryâ€™ for the worst times.Â Controlling our neurology means we will act as we wish under stress instead of how our nervous system would have us act. This is the difference between the caveman and the soldier…controlling our actions.Â Combat is 10% what happens, and 90% how we react to it. 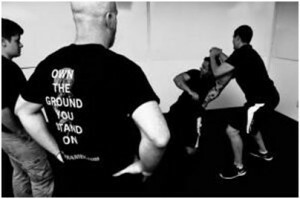 In physical training, our combative training experience has shown us what works, what doesn’t, and we use that experience to create a combative style that is our own in our physical actions. We apply the sciences in order to gain skill over the weapons we use, be they internal such as a kick or strike, or external, such as a firearm or knife. Our body should be as much of a honed weapon as the one we train to employ. Spiritual confidence comes in two forms. A knowledge that there is something larger than ourselves, be it God or moral and ethical common themes. This allows us to make the right decisions in interaction with the world around us. It forms our character and character dictates the actions we take.Â As my good friend Jeff Bramstedt of lifeofvalor.com says, the person we are in public is a reflection of who we are in private, at our best and worst.Â If our capacity to control our needs and wants exists when we are in private, it will exist when we act in public. But, spiritual confidence is also found in hard training – the spirit to continue because we have been pushed in training to know we can. Having heart is not only circulatory, but in the figurative heart, or the willing to to complete our task – protecting ourselves, others, and to not give up in the face of adversity. To have an espirit de corps not only with those we fight alongside, but a feeling of self pride, devotion to our beliefs, and harmony of the mental, physical, and spiritual self. When we master these three elements of knowledge…confidence is created. We embody the knowledge of self, or as the mind wills the body does. 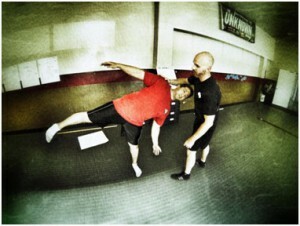 As our mind and body grow stronger, our confidence is shown in our posture, our movement, and actions. When our confidence is evident to others, they see the ground we stand on as being owned by a confident individual. A criminal or aggressor is not a psychic reading our thoughts – they must read what they see.Â When they see a confident individual they must decide if they will come into the space that the confidence exists within and challenge that confidence.Â They can read their prey as a wolf reads an injured animal in the herd.Â Rarely do wolves attack the strongest or alpha male…so we must strive to be the alpha male they will not attack and in turn we must protect the weakest.Â This is the ultimate expression of the concept of being the sheepdog. Without a governing philosophy we become lost.Â We then begin to train in action but without purpose.Â We buy products for our training without a knowledge of how we will make the equipment a part of our physical, mental, and spiritual self.Â Instead we must master the elements and become intelligent.Â An intelligent fighter will find a way to prevail, their physical skills will give them the means to do so, and the spirit will ensure they not quit until the task is done. Having taught civilians, law enforcement, security teams, and soldiers for 15 years I have learned one thing:Â owning the ground you stand on in class takes the same confidence required to own your ground in a supermarket in the worst part of town. We all suffer from pride and internal conflict in many forms on the line and in class.Â Am I fastest?Â Did I just screw up that reload?Â Are my shot groups as good as everyone else? Did my strike work?Â How would I do if the SHTF?Â Use the training ground that is the range, gym, dojo, or books you read to gain this confidence.Â Internalize it – you will see your body change, your mind change, and the opinion of those around you change to respect as you respect yourself more.Â The internal questions you ask will disappear through experience. If you can master this sense of internal conflict, you can become confident not in the weapon you carry, but in the weapon you are. Sounds similar to a technique I developed when training horses several years ago. Most of the time when you square up to an unbroken horse in a round pen and get inside their bubble to challenge their authority, they will test you. They’ll rare up, kick in your direction, run around, back their ears, or do any number of things that horses do to assert themselves. When a human reacts negatively to that, by flinching, wincing, darting away, etc., the horse just learned that he owns that person. My technique was similarly to read the horse’s bluff, stand my ground or even advance toward its threats. That way the horse saw himself as out of control and me in control. To the horse, I became an immovable object with which he did not want to compete. Soon the horse grew weary of feeling out of control and sought a sense of control and security. Since the horse saw me as being the only thing in control in his environment, he started to see me as a source of security and would start approaching me submissively. By doing that, I could take a wild horse out of a field that had never been handled and be riding him in just one evening of work without ever having him buck or ever having to use ropes or snubbing posts to restrain and break his will. The horses will remained intact instead, but had been psychologically altered to align with mine to achieve a sense of security. And that’s how I made pocket cash in high school and college. Only on rare occasions did that technique fail and resulted in a collision between myself and that horse. Those few horses turned out to be true “crazy” horses with no respect for themselves or others, and I am not aware of any of them that were eventually ridden by anyone who didn’t end up getting bucked off repeatedly until they got hurt and passed the horse off to the next person who had the same experience. I’ve found that the technique works similarly with people. Awesome. Thank you for the note!